This beautiful little gem is located up in the hills of Fern Valley on a private lot. Up the stairs you will find a darling cabin with a large deck and gorgeous tree top view. This deck will be the perfect place for you to relax with your morning coffee or enjoy the soft afternoon breeze while sipping a glass of wine. 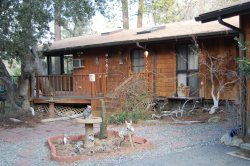 The incredible pine trees that cover this property are home to many different types of birds, chipmunks, and squirrels. Bring your binoculars and be amazed at the vibrant colors our mountain birds have. Inside the cabin, you will find a large kitchen with all the comforts of home and a dining table for four. Pass through the kitchen into the living room where there is a large slider leading out to the deck so you can continue the breathtaking outdoor views. A big fluffy couch and plenty of seating to snuggle up on to watch a movie or just enjoy the duraflame fire in the fireplace. Also on this level is a good size bathroom. Up a small flight of stairs, there is a bedroom with a queen size bed and a set of bunk beds. The perfect set up for a family camp-out style slumber party. Soft yummy smelling linens ensure you will cuddle up and sleep like a baby. This house is secluded and there is a steep driveway and a fair amount of steep stairs to reach the home. During the winter snow months there is a bit of a walk up the driveway to access the house.